Pearson Medical Technologies offers the simplest, semi-automatic, portable, and safe deblistering recovering machine. An electric eye detects when the blister pack is in position and a sensor activates the roller automatically. Oral medications are gently removed from the pack and separated into a collection drawer without causing any damage to the pills. The collection tray is easily removed for cleaning to prevent cross contamination from pill dust. Press-Out Semi-Automatic is perfect for operations which need flexibility for lots of different blister push-through formats. The patented roller and guide system gently eases product out of the pocket so that minimal pressure is exerted on the tablets. The neoprene rollers come in different grades of hardness so that softer guide rollers can be used for more fragile products. Foil remains attached to the waste blister pack during deblistering procedure. Waste blisters and recovered medication are collected separately. 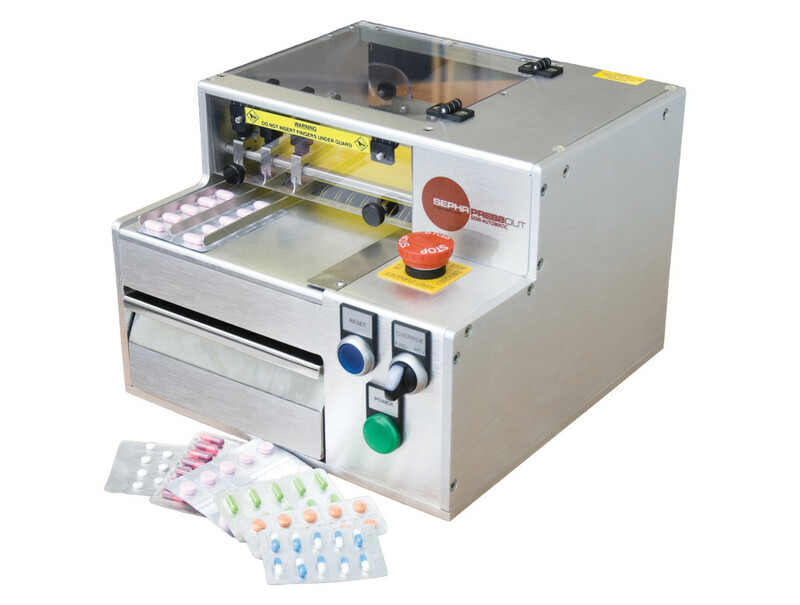 Eliminate manually deblistering of each individual blister pack or card. Efficiently deblister packs much quicker and easier. More pills removed from packs using the machine rather than manually removing pills. Portable deblistering wherever you need it! This machine is light enough to be lifted and moved from bench to bench. Does not need to be connected to an air supply. Constructed in stainless steel and designed to cGMP standards for easy cleaning. Recovered product does not need to be handled by operators.